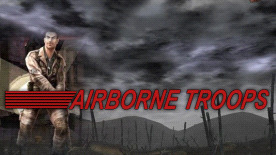 Airborne Troops is an absorbing infiltration action-adventure game that takes place in occupied France during the Second World War. On a mission to drop two secret agents into occupied territory the Sergeant's aircraft is shot down leaving one of his agents seriously wounded. It is now the Sergeant's duty to replace the ailing agent and complete the stealth missions himself. The gamer takes part in commando missions based on real events in the places where they actually happened, accurately recreated from archives and historical documents. The action is a mix of furious gunfights and stealth elements, with paratroopers equipped as they were at the time.